The million-copy bestseller by ?the man who remade motherhood? (Time) has now been revised, expanded, and brought thoroughly up-to-date ? with the latest information on everything from diapering to day care, from midwifery to hospital birthing rooms, from postpartum nutrition to infant development. The Searses draw from their vast experience both as medical professionals and as parents to provide comprehensive information on virtually every aspect of infant care. 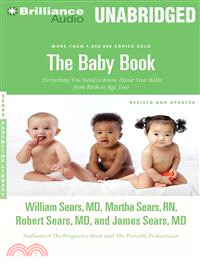 The Baby Book focuses on the essential needs of babies ? eating, sleeping, development, health, and comfort ? as it addresses the questions of greatest concern to today's parents. The topics covered include: preparing for a safe and healthy birth ? bonding with your baby ? feeding your baby right ? soothing your fussy baby ? getting your baby to sleep ? understanding your baby's development ? treating common illnesses ? babyproofing your home ? understanding toddler behavior ? dealing with temper tantrums ? toilet training ? working and parenting ? first-aid procedures ? and much more Unrivaled in its scope and authority, The Baby Book presents a practical, contemporary approach to parenting that reflects the way we live today. The Searses acknowledge that there is no one way to parent a baby, and they offer the basic guidance and inspiration you need to develop the parenting style that best suits you and your child. Their book is a rich and invaluable resource that will help you get the most out of parenting - for your child, for yourself, and for your entire family.